For drivers looking for a way around $4 per gallon gasoline, an alternative is vehicles that run on Compressed Natural Gas, or CNG. OCCC now has two CNG vehicles. 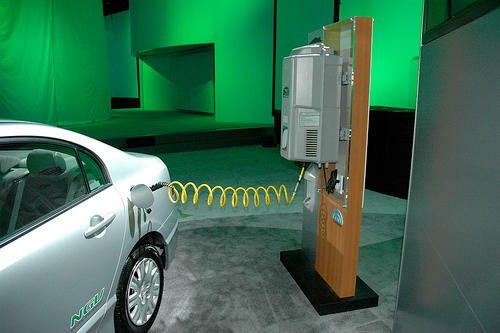 CNG has become a low-cost alternative to gasoline. The highest current price of CNG in Oklahoma City is $1.39 per gallon, while regular gas is priced on average at $3.79 per gallon. OCCC owns one donated CNG vehicle, which is a General Motors car. Steere said they needed this vehicle for classes in the Automotive Technology program. OCCC later purchased another CNG vehicle, a 2010 three-quarter ton Chevrolet Silverado pickup. He said they occasionally use this vehicle in class, but its main purpose is for promotion. They drive the CNG Silverado in and out of state to advertise OCCC’s CNG program. On the back of the truck it has a picture of the campus, Steere said. “Close to 42 gas stations in the state sell CNG,” he said. CNG is methane that is piped throughout the U.S. at a low pressure. It’s the same substance that is piped into most homes to heat water and furnaces. “At the station they have a compressor that compresses (the gas) and puts (the gas) into large cylinders,” Steere explained. OCCC offers two programs for CNG. One is a state certification program for auto mechanics that teaches all the safety information and general information. In Oklahoma mechanics are required to be certified to be able to work on CNG vehicles. The second program is an installer program that teaches technicians how to put a CNG system on a vehicle that was built to run on gasoline. To learn more about these programs and CNG vehicles visit OCCC’s website at www.occc.edu. For more information, e-mail Steere at rsteere@occc.edu.